Red Bull continued its assault on rivals Mercedes and Ferrari with further aero tweaks at the French Grand Prix. 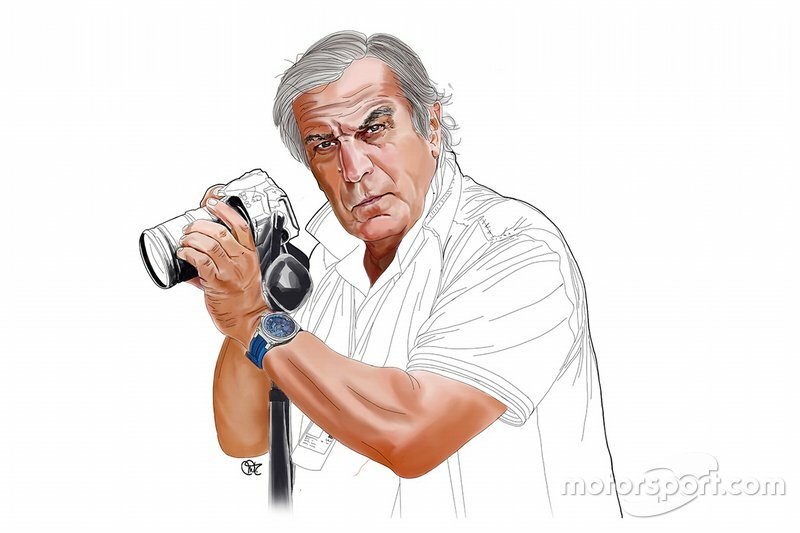 Undeterred by the power deficit it faces against its main rivals, the team is clearly leaving no stone unturned in its effort to ensure its chassis is performing as well as it can. 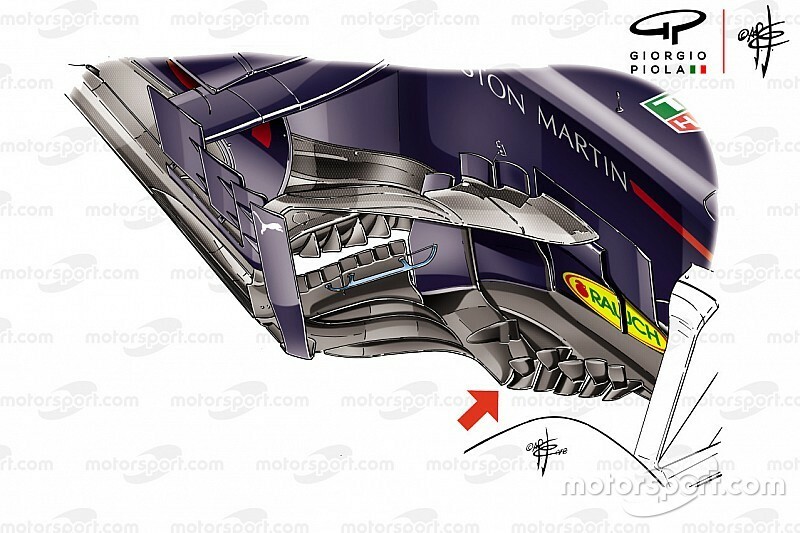 One of its main areas of change has been in the bargeboards, which are now incredibly complex. The new-for-2017 regulations offered the designers a way of expressing themselves more freely in this region of the car. Red Bull has made the most progress in this respect, given that it started with the least complex bargeboards on the grid in 2017 and has had to incrementally add layer after layer of complexity to improve the car’s overall output. The latest changes, as detailed in the animation above, have seen additional turning vanes added to the serrated footplate, whilst the existing ones have all been modified to complement them too. Changes made in this area of the car are often paired with ones up and/or downstream too, as the team looks to unify the flow structures in order that an overall uplift in performance is achieved - giving the drivers the faith to push the car harder. In this respect the update is a further optimisation of what was first introduced in Spain, as the team added three additional strakes on the leading edge of the floor, documented with some of the other changes in the 3D animation above. 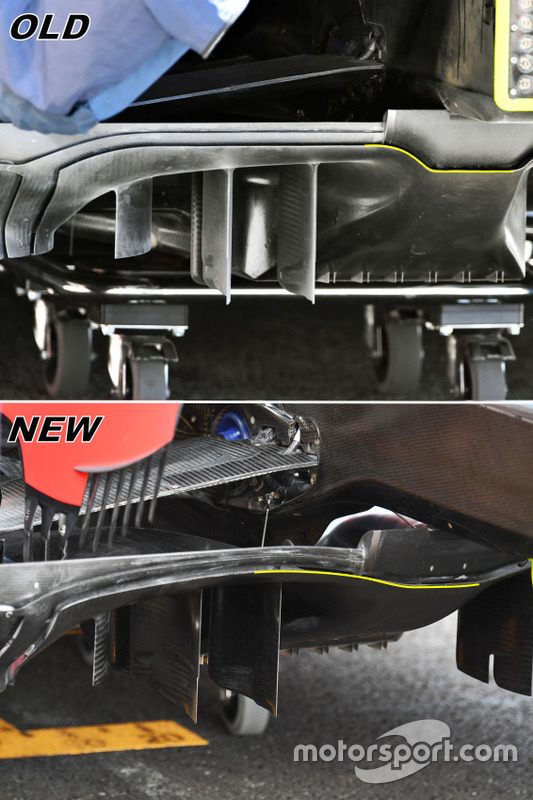 As part of the French GP update package, the diffuser was also modified, with the central section becoming the focal point of this particular update. The square profile of the transition has been discarded in favour of a more gentle geometry, with the flapped section above altered to suit.